Happy Chinese New Year 4712 the year of the horse. A galloping horse may come to your mind which is exactly what this year is about: travel. I have been enjoying traveling through my cooking. I am really getting a feel for Chinese cooking which is exciting because my family loves it so much. Since the time I lived in Chinatown in New York City I have enjoyed Chinese New Year. The Red Lantern parade is really something to see. If you live near a city that has a Chinatown try to attend it one year. You won't be disappointed by the costumes and the fireworks. There are many traditions involved with Chinese New Year. One of them is giving oranges to friends and family. Orange sounds like the word for gold in Chinese, so when you give an orange you are symbolically giving wealth and prosperity. 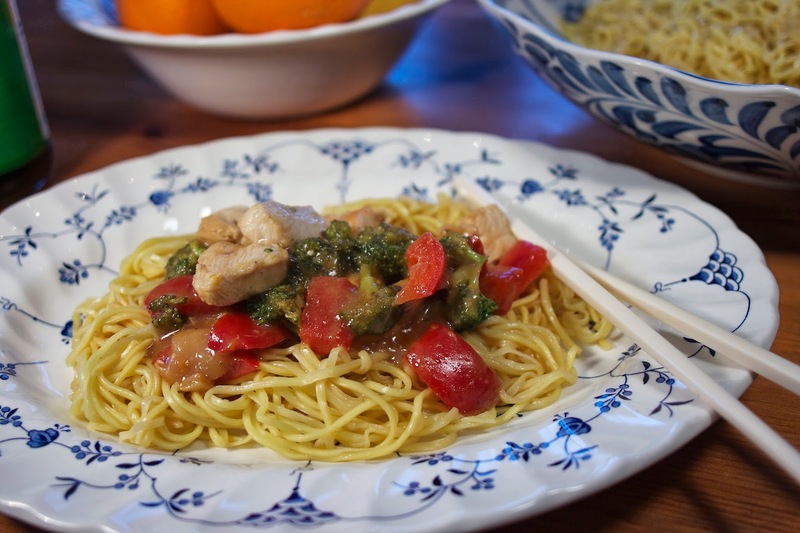 Dishes made with orange are common over this holiday, along with eating long noodles which symbolize longevity. I put both of these traditions together in my Orange Chicken dish. May this year bring health, wealth and good travels to you and your family. 1) Bring large sauce pot of salted water to a boil for the noodles. 2) Whisk the ingredients for the sauce together in a large bowl. 3) Put the chopped chicken into the sauce to marinade. This can be for a few minutes, hours, or overnight. 4) Heat a large skillet or wok with about 1/4 cup of vegetable oil on medium high heat. Saute the broccoli, red pepper and garlic with 1 tablespoon of water until they start to soften. 5) Move the vegetables to the sides of the skillet/wok and put the chicken pieces into the pan. Do not add the sauce yet. Saute the chicken until it is opaque. A metal spatula works well so you can scrap the bottom on the pan to prevent sticking. 6) Mix the chicken well with the vegetables and add the sauce. Heat through and cover with a lid until noodles are cooked. 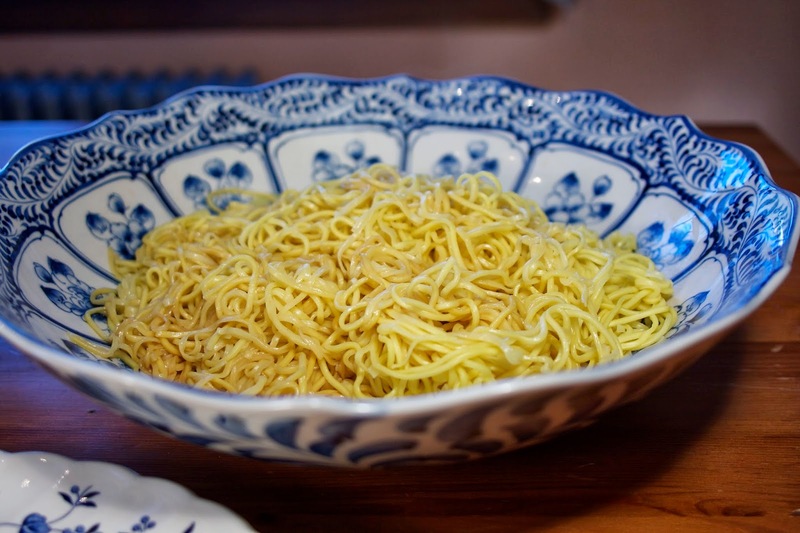 7) When noodles are cooked toss them with about 1/4 of soy sauce and 2 tablespoons of sesame oil… Do this to taste. 8) Serve the chicken on top of the noodles. 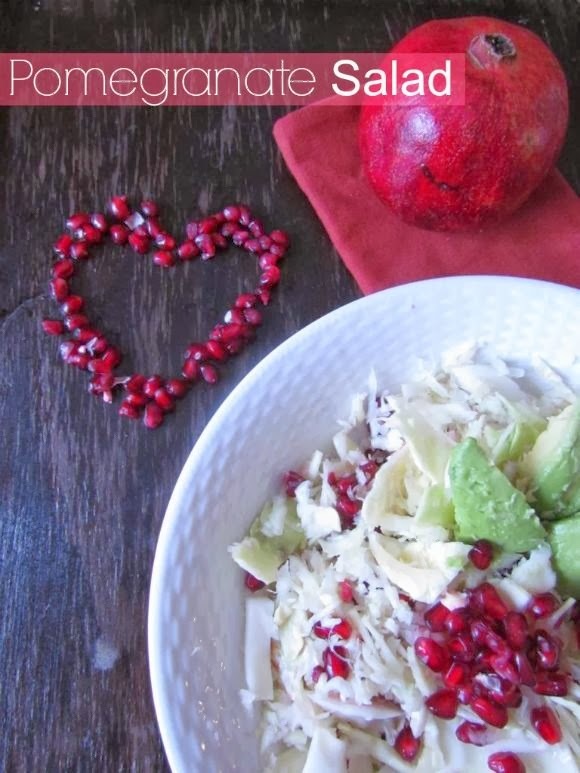 Now here is the perfect healthy and interesting starter to you Valentine Meal. Hands down this is the most unusual pizza I have ever encountered. 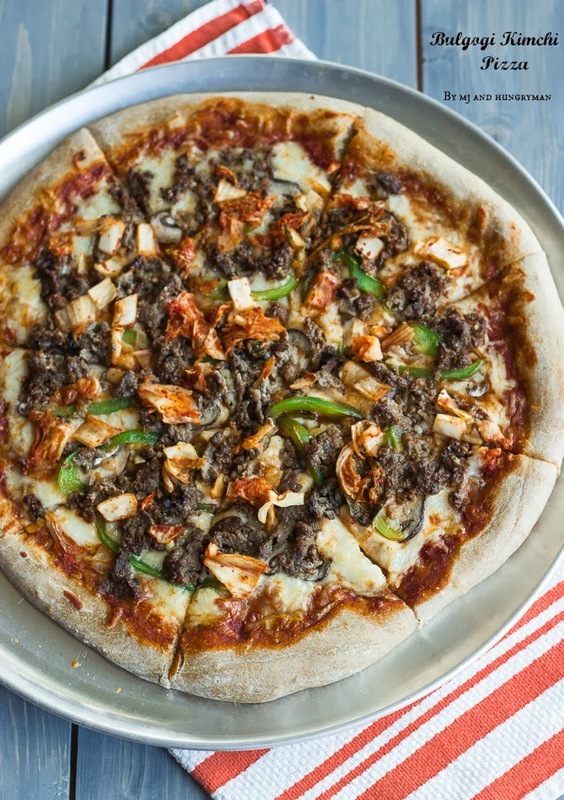 I learned about the beef dish Bulgogi and how to use it on a Korean Pizza…way cool. I'm giving the special ingredient away it's silken tofu. I used to make this pie when I was off of dairy. It is so delicious and low in calorie. It may even be a bit healthy…try this. What a great post and your Orange Chicken looks delicious! Hope you have a great weekend and thanks so much for the party! Thanks Miz Helen… it's a fun holiday. It was great… the orange zest really made the orange flavor pop. I'm so excited that I can not only cook but write Chinese cooking recipes. I can't tell you how many failed attempts my family has suffered. Really delicious chicken and very easy to make. Good to see you Angela. Your Orange Chicken sounds delicious and looks beautiful. The marinade and the broccoli and spices would taste so good, I'm sure! I wish I could get my husband to like it -- we'd have it often! Bummer a husband who doesn't like Chinese food. No take out items at all you can copy? Thanks for the party and your chicken dish looks awesome... 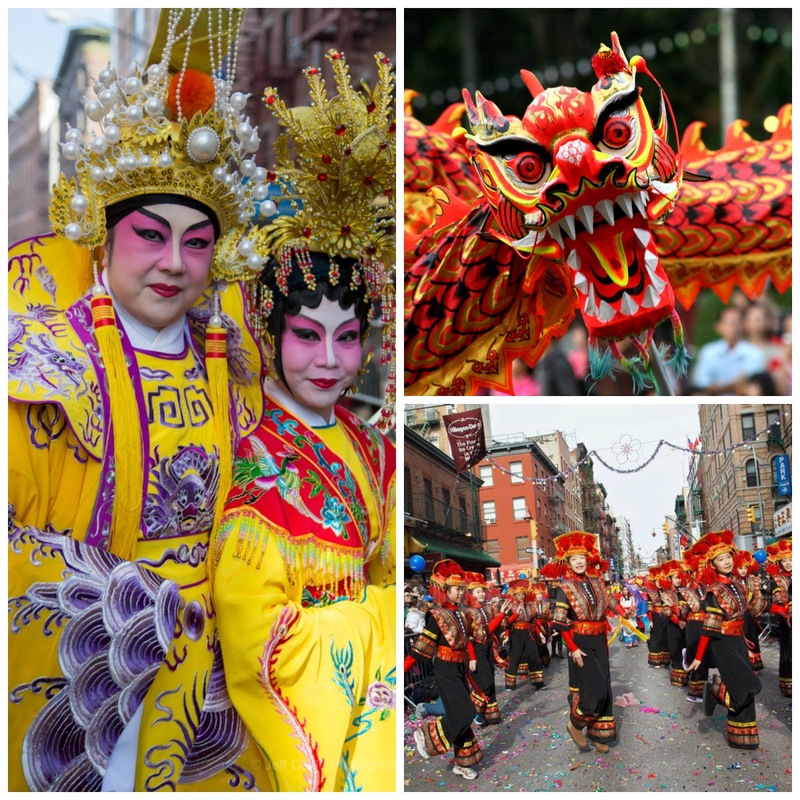 I've been to Chinatown in NYC - not during parade time and the food was wonderful! It was incredible living in Chinatown. The fish and produce were super fresh and cheap. Chinatown is a really fasinating place… so much to explore and their noodles are amazing. I love your orange chicken to celebrate Chinese New Year and how fun to see everything in Chinatown. Thanks for hosting each week and I hope you have a lovely weekend. I can see you liking this dish.. you are so good at putting fruit flavors into savory dishes… this is one of my most successful recipes. The orange chicken looks delicious. My husband loves Chinese food and we are always looking for homemade recipes. Thanks for hosting and have a great weekend! It is so much better to make Chinese food at home… no MSG… etc. I hope you'll give the recipe a try. Thanks for coming Sandi.. Happy New Year. You are very welcome. I forgot to stop by your site and let you know that I will be pinning and tweeting your recipe this week. Happy New Year. Diane, your orange chicken looks yummy! I thought I fixed the subscriber earlier in the day. I entered an email and it worked? I some how merged the inlinz and the subscriber weirdest thing. The link is fine now. 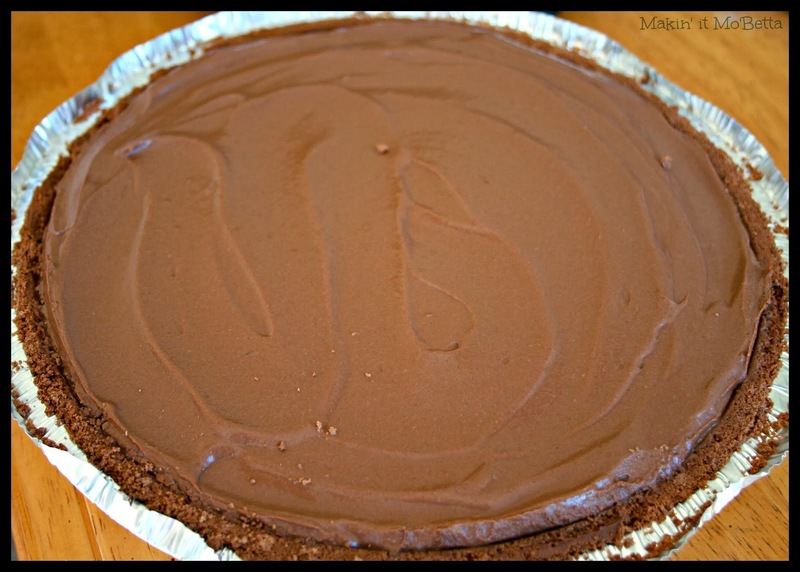 Thanks so much for featuring my Chocolate Pie! I love preparing Chinese food at home. It is so much healthier and tastier than the take out I can get around where I live. I absolutely agree… and it can taste better too. I prefer to know what I'm eating. Hi, Diane! I don't have a food post this week. Just wanted to stop in and say hi. I like how you've combined two Chinese traditions into one dish to celebrate Chinese New Year. You are so sweet to stop by… Happy New Year. Yes, I really excited that I am getting a handle on Chinese cooking… I've come a long way from burnt rice and greasy sauce. Orange noodles is good for longevity and prosperity... I'll have to keep that in mind. I always love visiting Chinatown in SF. I was in NY last year but didn't have time to visit Chinatown. Thanks for hosting! I went to the Chinatown in SF you would love the one in NYC too. Hope you get a chance. 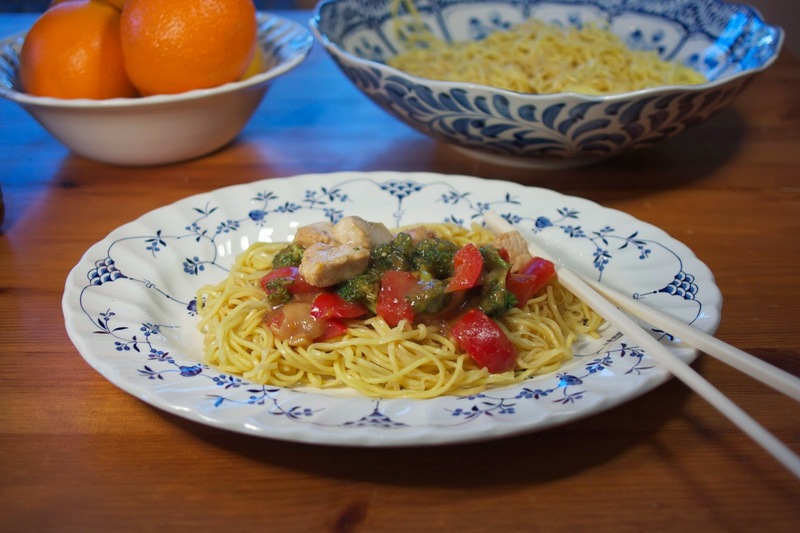 Yes, the noodles with or without the chicken were a big hit with my kids. Thanks for coming by. I'm saving this recipe to make for our kids. They love Chinese food, and always ask us to order take out. My kids love the take out too.. this is so much healthier and the dish was very kid friendly. They loved that there was OJ in it for some reason? Love this pasta, Diane. That's my kind of meal! Thanks so much for joining us at Marvelous Mondays Pinned to my Marvelous Mondays board! Thanks for pinning it Paula... always great to go to your party. Back again to say thanks for linking this up to our Marvelous Monday party! Pinning! Thanks for pinning Deb...love Marvelous Monday. I didn't know about the significance of oranges! This dish looks delicious. Thanks for linking to the In and Out of the Kitchen Link Party. Hope to see you next week. Like Cathy, I had no clue about the significance of oranges in Chinese culture. This was interesting. Your orange chicken sounds really delicious. Thank you so much fr sharing at Tasty Tuesday. I am featuring it this week ! Have a great day. So much wonderful food on this post! Hope you are having a great week and thanks so much for sharing with Full Plate Thursday!